You must be aware that Nintendo 3DS is one 3D gaming device that does not need to have its user wear glasses. Well until that comes out, Rockchip will be the first to offer that technology to consumers with its tiny portable media player which does not need you to wear 3D glasses. 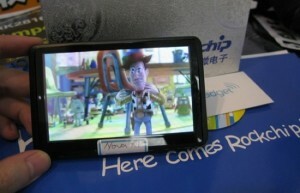 The media player made by a Chinese company called Rockchip has launched the Supernova X1 which is a portable media player that can show 3D videos without the need for the glasses. The player uses its own custom 3D format and any 3D video must be first converted to that format for the player to play. How the technology works or details about the 3D software are still unknown however from the picture it seems to be small and quite portable. More details are expected to be released at the IFA event. Next Facebook trying to Trademark “Face” and “Book”!